1. All ELLs are immigrants, born outside of the United States. In the Video, Vicki Schoen, states "We are all immigrants of our ancestors." This statement is a fact, but the misconception that all English Language Learners are immigrants is not. 2. All children learn second languages quickly and easily. All children are different and come from different walks of life. Students all have different backgrounds, cultures, education, and social classes. Each of these factors plays a role in student development in school, which includes learning a second language. Some students might have supportive families who are helping them learn the second language and supportive in the process, other students might have parents who don’t think it is necessary for them to learn a new language and don’t allow them to speak the language at home (Wright, 2010). Along with experiences and family support some languages are similar to others, therefor it would be easier to learn and some are completely different. Teachers should assume that young students struggle when learning a new language; therefore teacher should be incorporating strategies that help students with their academic vocabulary, language demands, and skills (Echevarría, Vogt, and Short, 2013). This does not mean that we should treat or assume that young students are less inhibited than older ones; it just means that we should still be providing students of all ages with the correct instructional needs to be successful. Learning a new language takes many years to perfect. It does not come easy for ALL students and it does not come quickly, with this myth it is good to keep in mind that “all students are different and they all develop at different rates” (Gunning, 2012 pg. 158). This is important to understand for teacher so we take the correct step and use the correct material and strategies to help support our ELLs. 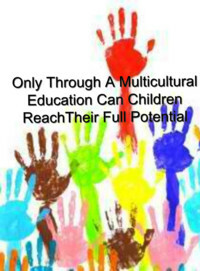 This picture reads, "Only through a multicultural education can children reach their full potential" and even though this is an opinion, it aligns with what our readings say. Students need to feel welcomed in school, from all cultures. The school environment for some students is rough and they do not feel accepted. Students need more than just a poster on the wall with their culture they need to feel apart of the school and that starts with teachers learning how to effectively teach students from other cultures, and put their own biases aside, embrace other cultures, and get to know their students (Wright, 2015). 3. "Implementing multiculturalism education is a relatively simple matter of including information about all cultures in the curriculum and teaching respect for them"(Hallahan, Kauffman, and Pullen, 2015). Multicultural education refers to education that incorporates histories text values beliefs and perspectives of people from different cultural backgrounds. However it is not as simple as putting a poster on the wall of another culture or sharing stories about the cultures in which your students are apart of. "Educators and others are struggling with how to construct satisfactory multicultural curriculum and multicultural instruction methods. Nearly every aspect of the task is controversy: which cultures to include, how much attention to give to each, and what and how to teach about them" (Hallahan, Kauffman, and Pullen, 2015 pg. 47). Multicultural education takes time in learning about other cultures and how to implement those into our standards, assessments, and instruction. The hope of multicultural education is to increase student understanding and feelings towards another culture and to overall make a sense of belong to others. Multicultural education now has researchers determining the best techniques and strategies to use in the classroom, however it will take time in perfecting (Hallahan, Kauffman, and Pullen, 2015). It is important for teacher to know that it will take time and will not come easy, so if it is not perfect right away that is okay. We just need to keep using reference and trying and it will all come together and eventually help benefit out ELLs. Being literate in their first language helps them make connections in their second language (Soltero, 2011). Why would we as teacher want to isolate the students and their language if it can help them build on their background knowledge as well as help them make connections and relate their prior experiences and knowledge to knew content? Languages, from all students and all cultures should be embraced within the classroom, not shammed. Building on both languages, English as well as students native language is needed to help students develop in second language. For Emergent Bilingual Students teacher should "emphasizes students’ development of both their native language and English" (Wright, 2015 pg. 97). Using a bilingual models, such as traditional, immersion, or dual language program, allows students to still use their language to some extent depending on the model. Each model has its benefits and has research to back up the model and the effects it has on students learn English language as well as developmental skills (Wright, 2015). This helps them relate their background knowledge, use what they know and have experiences to apply it into new concepts in the English language (Echevarría, Vogt, and Short, 2013). This is important for teacher to know so that they make sure to allow student to communicate in both language, provide examples related to that language, and when necessary provide material in both languages. 5. Total English immersion is the best instruction to use. A lot of English language learners and their families are coming to the United States to create a better life for themselves. The students and their families for the most part understand the importance of becoming fluent and literate in English to be successful in the United States. The students are going to need to learn academic language and academic content. Students need to develop all area of academic language, which include reading, writing, listening, speaking, as well as academic language(Echevarría, Vogt, and Short, 2013). Other studies show that total Emerson is not enough to learn the necessary academic language and they need additional support. Research shows that students need both shelter instructed and English language development to gain academic English (Soltero, 2011). Shelter instruction is instruction that is taught in English but the teacher uses strategies, material, and teaches it in a way that makes it comprehensible for ELLs (Echevarría, Vogt, and Short, 2013). Students need both the additional support in developmental skills and demands as well as the content in order to become literate and have a chance to be successful in school, as well as life after school in the United States. This is important for teacher to know so that they can best plan for their instruction and find a balance between different instructional strategies. 6. Shelter Instruction and English as a Second Language are the same. Many believe this is true, however they are not. The focus of English as a Second Language(ESL) is reading, writing, listening, speaking, vocabulary, and communicative competence. The focus of Shelter Instruction is content areas, such as Math, Science, Social Studies, Literacy, Art, Music, etc. Assessments for ESL are focused on those stated in the English Language Development/proficiency standards and the assessments for Sheltered Instruction is based on classroom based content area standards (Echevarría, Vogt, and Short, 2013).They do share a common area, which is they both incorporate the importance of academic language as shown in the picture to the left (Herrman, 2014). This picture clearly shows the difference between the two, but also why some people might believe they are the same. "The distinction between ELD and sheltered instruction is important. In ELD, English learners are explicitly taught the language skills needed to be successful in classrooms. The emphasis in ELD courses is on English language skills. Though the students may use content or content area topics as a vehicle, the learning and practice of language skill is the emphasis in these classrooms" (Herrman, 2014). Espinosa, L (2008). Challenging Common Myths about Young English Language Learners. NewYork, Foundation for Child Development. Herrman, E. (2014). Sheltered instruction and English language development: Key components. Academic Language Learning Institute. Soltero, S.W., (2011). Schoolwide Approaches to Educating ELLs: Creating Linguistically and Culturally Responsive K-12 Schools. Portsmouth, NH: Heinemann.